I’m traveling north to south on this first visit to Viet Nam, trying to see all the places that are at the top of my list while leaving some places for another trip. Any UNESCO World Heritage Site gets my attention. There are eight of them in Viet Nam and I’ll happily see five sites on this trip. Ha Noi’s Old Quarter is a UNESCO site and so is the ancient port of Hoi An – my next stop. Da Nang was the largest US airbase in the country during the war here, and was considered at the time one of the busiest airports in the world. It was home to the largest US helicopter base. On the short drive to Hoi An we passed rows of crumbling, moss covered concrete hangars that once housed the big Huey’s and Sikorski’s that were such a trademark of the conflict. And we drove along the miles of stunning coastline once known to thousands of American GI’s on rest and recuperation as China Beach. The beach is barely visible now in the gaps between miles of looming resort hotels. 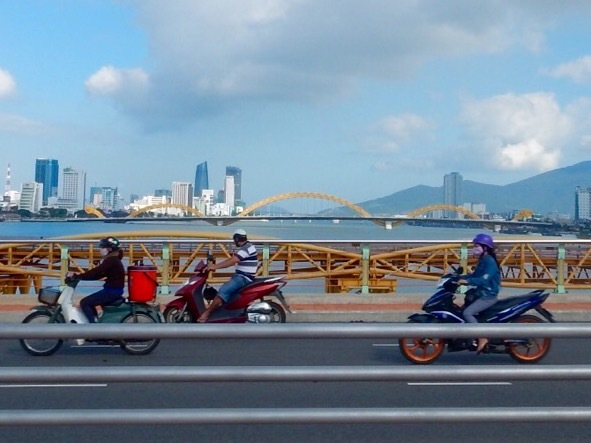 Da Nang is a city clearly coming into its own with wide, orderly tree-lined boulevards, modern condos and office buildings, and massive state-of-the-art shopping plazas featuring skating rinks and water parks. It’s slightly unsettling to see so many familiar American logos mixed in with remnants of what the Viet Namese still refer to as the occupation. The Dragon Bridge is one of Da Nangs crowning achievements. Designed by an American firm and completed in 2014, the golden beast spans the massive Han River, spewing fire from its two heads every Saturday and Sunday evening at nine o’clock. In my home town of Vancouver, Canada we fire off a cannon every evening at nine but I think a two-headed, fire-breathing dragon would be so much more fun! 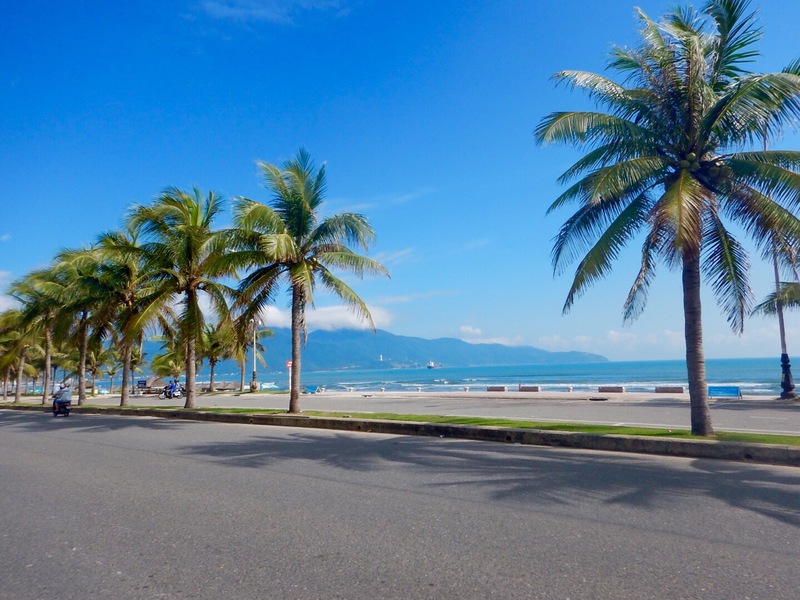 Beautiful white sand beaches line the coast from Da Nang to Hoi An. Once known as China Beach it now has various names from section to section. I’m staying on the beach in Hoi An and once settled in I was anxious to throw myself into the South China Sea. 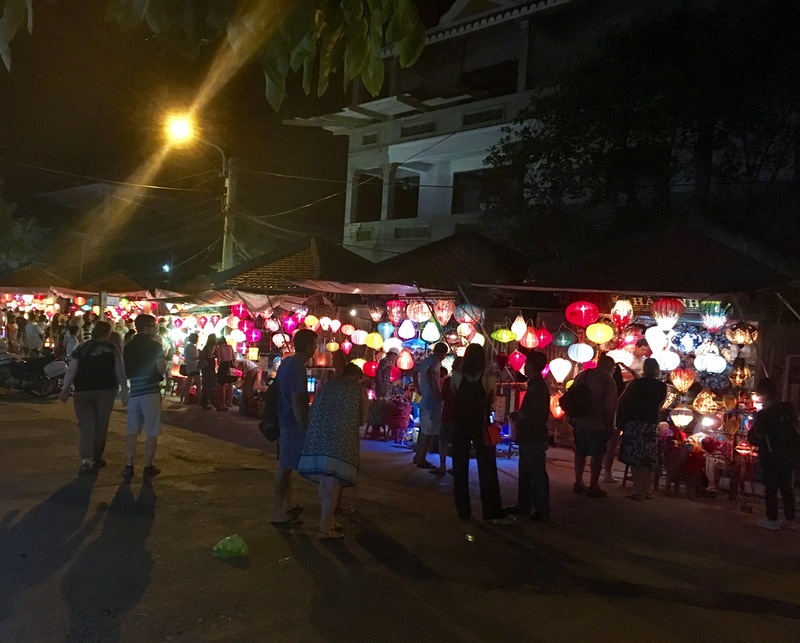 I happily squandered the rest of the daylight hours baking on the hot sand, so it was after sunset when I finally wandered into Hoi An Ancient Town…and what a completely appropriate time of day it was to first experience this delightful place. 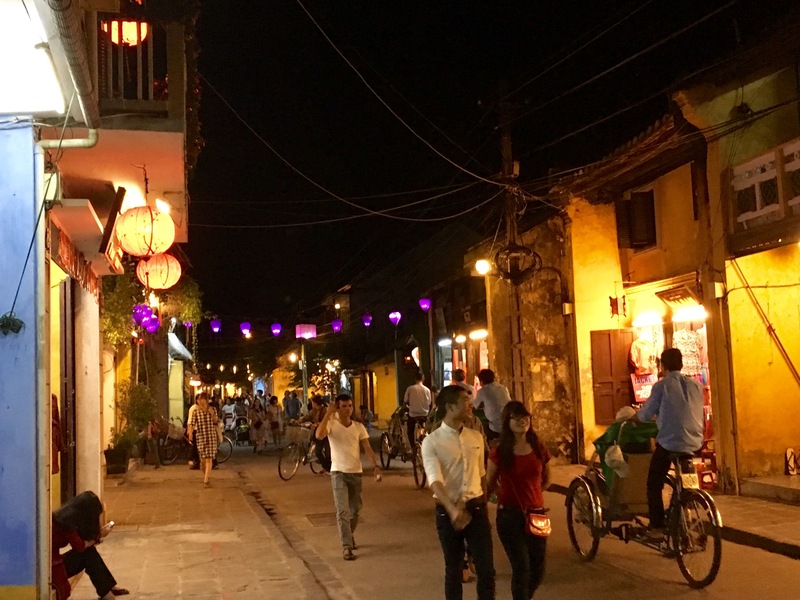 Streets in the oldest area of Hoi An are for pedestrians and bicycles only. What a relief after the ‘take your life in your hands’ attitude to pedestrians in Ha Noi! Lanterns are iconic here. 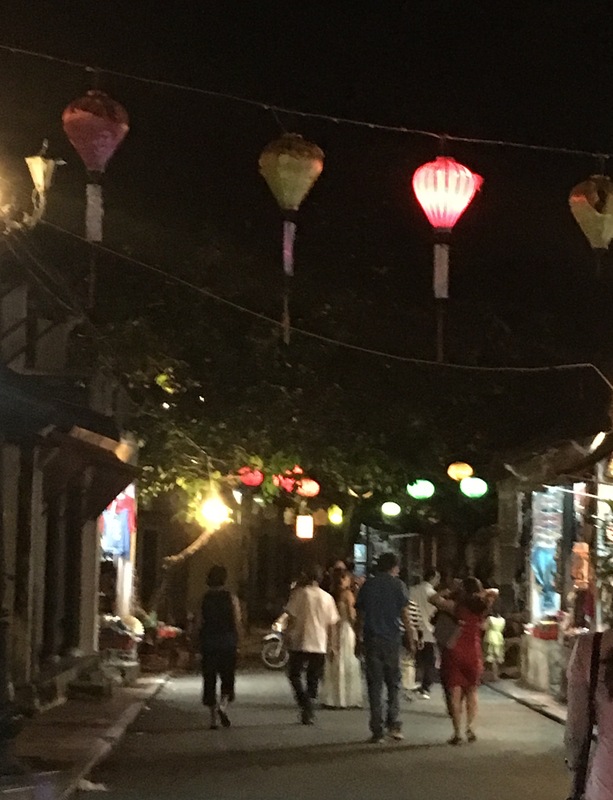 Graceful silk and paper lanterns illuminate streets and shops. 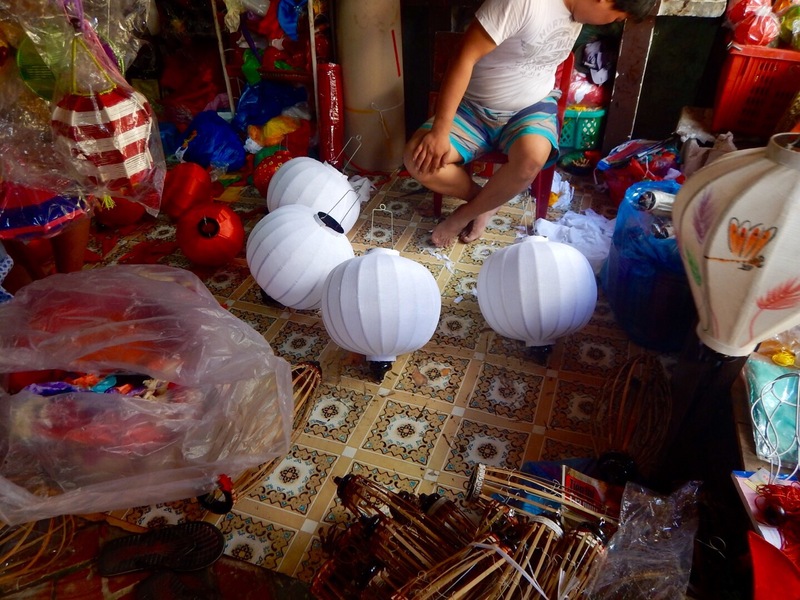 There’s even a market dedicated to lanterns. The lantern market. There’s something here for everyone. Lanterns can be made to order in about an hour or you can take a class and make your own. It’s against the law for Viet Namese to gamble but this highly animated nightly game of bingo doesn’t seem to count. 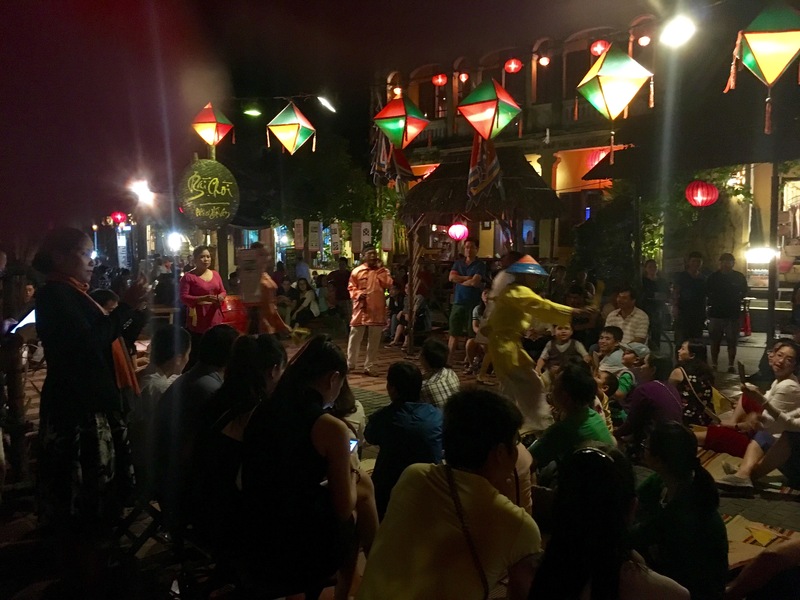 Hoi An was one of the earliest trading ports in Viet Nam, established in the first century on the Tho Bon (pronounced too-bon) river it was at that time the largest harbour in Southeast Asia. Hoi An grew up along both sides of the Tho Bon, joined here and there by beautiful arching footbridges. 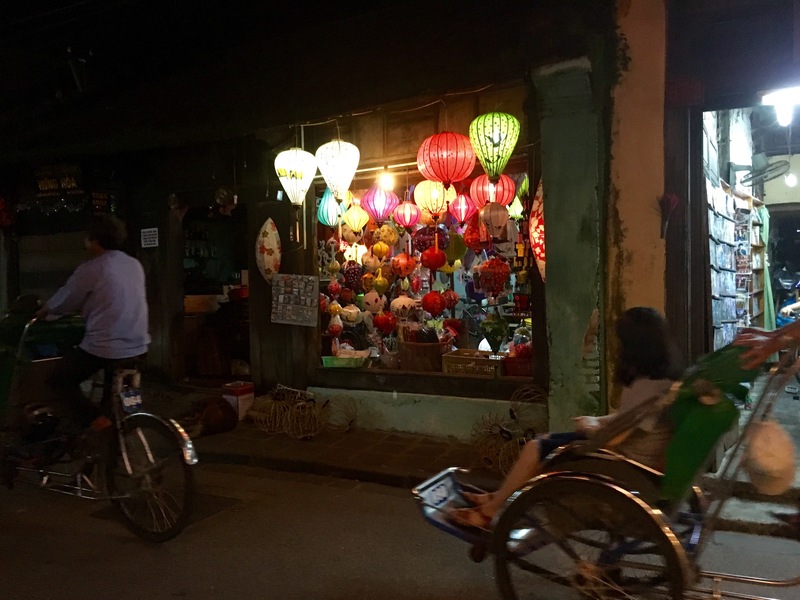 I drifted aimlessly for awhile through the winding streets of Hoi An completely enjoying the walk, the warm evening air and the delicious street food. I’d found such a perfect retreat from the pace of Ha Noi, the crowds, smells and the cacophony of constantly blaring car and motor bike horns. I felt life could not get much better…and then I found this. 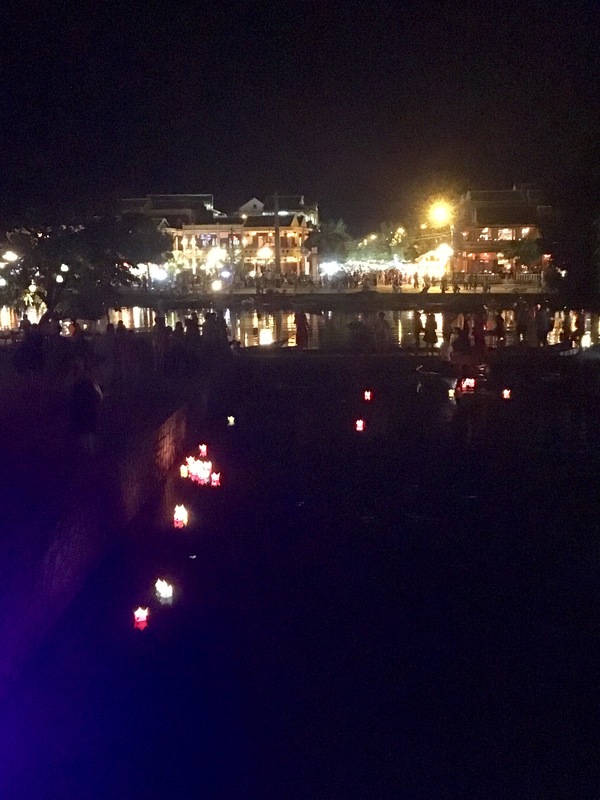 The gorgeously lit footbridge that joins the two commercial areas along the Tho Bon river and iconic Hoi An paper lanterns floating on the water. 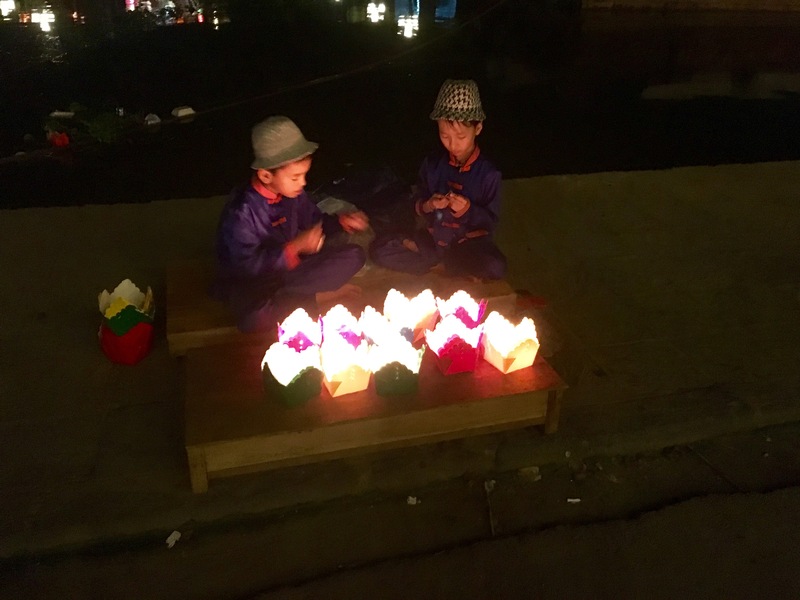 There are many, many vendors along the riverfront who will sell you a paper lantern for about a dollar, so you can make a wish and set it afloat. These two dudes are my favourite. 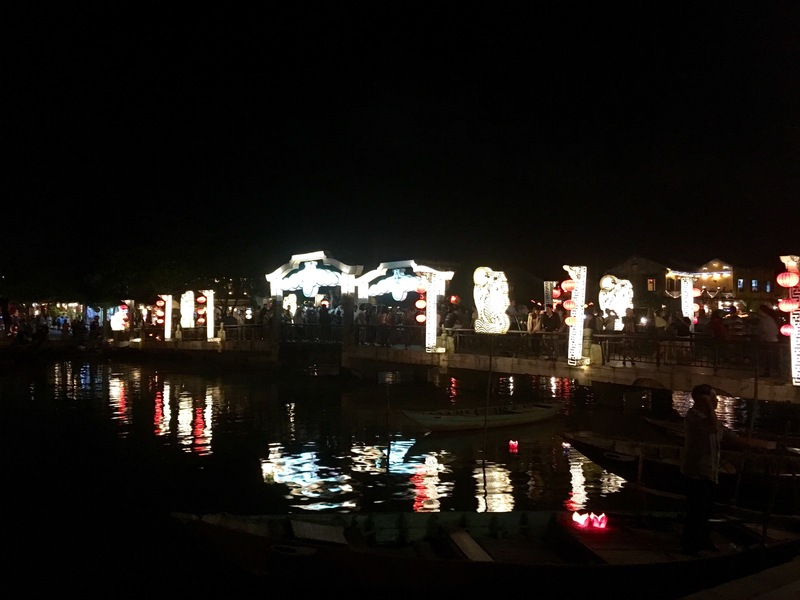 Lanterns are lowered onto the water from the footbridges with a long bamboo pole with a wire loop on the end. Or for a few dollars one of these women will paddle you out to make your wish and float your lantern. It was a seriously magical first glimpse of Hoi An and I lingered around this gorgeous little piece of sorcery for as long as I could keep my eyes open. Then I reluctantly headed for bed with the happy prospect of seeing Hoi An by daylight in the morning. Good night!